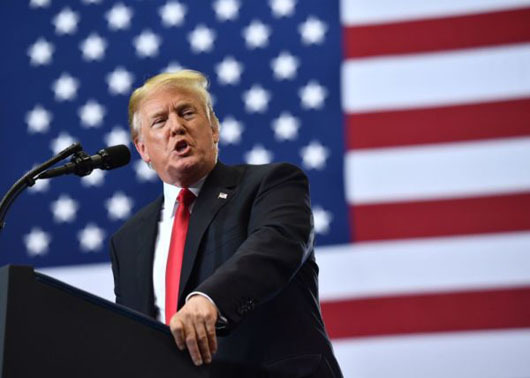 U.S. President Donald Trump at a rally in Nashville, Tennessee on May 29 reiterated his campaign pledge that a wall will be built – and Mexico will pay for it. “In the end, Mexico is going to pay for the wall,” Trump said. “They’re going to pay for the wall, and they’re going to enjoy it,” Trump added. Mexican President Enrique Pena Nieto tweeted: “President @realDonaldTrump: NO. Mexico will NEVER pay for a wall. Not now, not ever. Sincerely, Mexico”. During the May 29 rally, Trump also warned supporters against becoming “complacent” in this year’s midterm elections as Democrats were “sticking together” to block his agenda. The president also boosted Republican Senate candidate Rep. Marsha Blackburn, saying “We need Marsha in the Senate to continue the amazing progress and work” of his first 16 months in office. Blackburn is expected to face Democratic former Gov. Phil Bredesen to replace retiring GOP Sen. Bob Corker. Trump called Bredesen an “absolute total tool” of Senate Minority Chuck Schumer. The president also highlighted Bredesen’s donations to Hillary Clinton’s presidential campaign in 2016. “Phil Bredesen supported her and he supported her ideas,” Trump said, noting Clinton was opposed to the construction of a border wall.